The LANDING MAT is a big crash pad. Soft foam breaks the fall and makes every landing a safe one. Encourages your players to go “full bore” in practice drills. Kick blockers dive onto it. 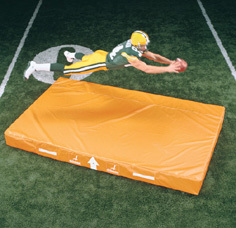 Backs use it to practice leaping over a pile-up at the goal line. Receivers use it to practice making diving catches. Rush Ends use it to practice sacking the QB. Linebackers and DB's use it to practice tackling. Measures 10" thick by 72" wide by 120" long. Four side handles make it easy to move. "The coaching point is to get full extension at the block point!"